We only do weekly rentals during the summer months. #1 Queen Bed, with en suite bathroom. #3 XL Twin Bed, with twin bed trundle. Remodeled Kitchen with breakfast bar and stools, dishwasher, kitchen table seats 8. All the basic necessities are included: coffee maker, toaster oven, microwave, stove/oven, refrigerator/freezer and all the cookware, dishes & utensils. Central air-conditioning and heat, big high definition flat screen TV in family room with local channels and satellite cable (with DVR), Apple TV and XM Radio (includes all sports programming). Washer/Dryer. Master bath with standup shower, second bath with a bathtub/shower. Deck, grill, table and chairs perfect for late night poker/board games, meals-overlooking the lakeside backyard and nightly sunsets. Large yard for additional activities such as wiffle ball, volleyball, tag football, etc.. Fishing right from the pier is fantastic. 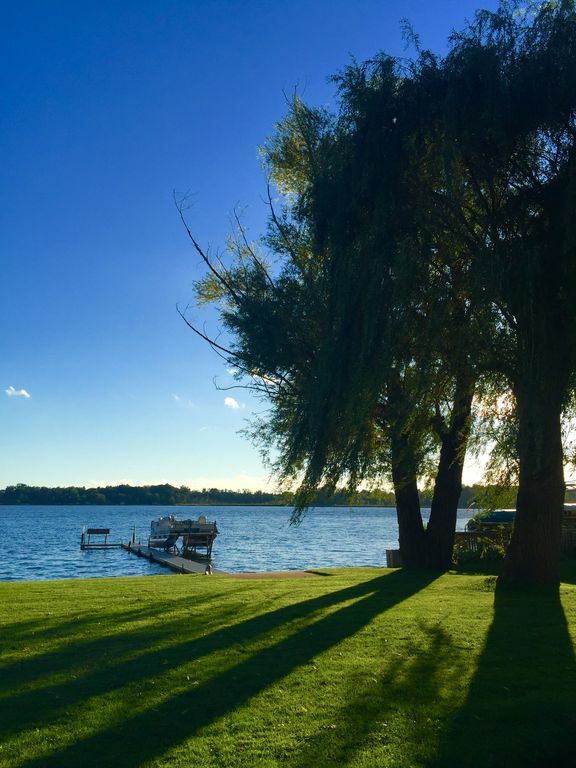 The lake has large and small mouth bass, walleye, northern pike, dogfish, perch, bluegills and crappies. The back lot is large and flat. This lake is a hidden gem with super low boat traffic. Pier has space available to dock your own boat. The Rock restaurant with live music and awesome food is walking distance from our front door. Several wineries nearby that would love you to swing by to try some samples, open year round. Several golf courses and a driving range in the area. Horseback riding, winery tours and road biking from your doorstep to a few minutes away (email me for any specifics you need). Plenty of restaurants and entertainment in Marcellus/Lawton/PawPaw (pubs, restaurants, movies, bowling, ice cream barns, antique shops). Two hour drive from downtown Chicago, approximately one hour to Notre Dame/South Bend, 15 minutes to Paw Paw, 30 minutes to Western Michigan University and Kalamazoo. 10 minutes to Swiss Valley Ski Resort, 40 min drive to Timber Ridge Ski Resort. Our lake home is clean and kid friendly. We have a good assortment of kid and adult games that we leave up year round. No pets allowed. No smoking in house. In the long term we are looking for a small, trusted group of families and responsible adults to rent to when we are not at the lake ourselves. Please do not hesitate to email or call with any questions and for additional photos. SKIING- Swiss Valley is a 10 minute drive, Timber Ridge is a 40 minute drive and also has a Tubing Park. SNOWMOBILING- Trail can be reached by snowmobile right from our property. Trail maps available. WINERIES- Several Wineries nearby for touring, ask for more info. DINING- We have a list of available dining and know the area well from our own experiences that we would gladly share. Air Museum- Located in Kalamazoo 30 minute drive. Go Karts/paint Balling/Miniature Golf- 20 minute drive. Notre Dame/South Bend- 1 hour 10 minute drive. Western Michigan University- 30 minute drive. Living room has high definition, 60" flat screen TV. Each bedroom has a high definition, 32" flat screen TV. Satellite cable with DVR (and local channels). Includes satellite Internet/Wi-Fi. SiriusXM Radio (all access package, including all sports programming) in Living Room. Includes wide variety of board and card games. Nintendo Classic and many more on iMac in Master Bedroom. The home was lovely. Plenty of supplies in the kitchen to cook for our family of 5. Lots of blankets for the cold nights. We’ve stayed in many VRBO rentals and this one was remarkably clean :). The kids loved the books, games and toys....that was a pleasant surprise. We very much enjoyed our stay. It was disappointing that Swiss Valley wasn’t open but we were able to ski at Bittersweet instead. We also learned that this is the first time in 50 years that Swiss valley hasn’t been opened over the holidays. Owners had a very thoughtful gift bag with some goodies and necessities waiting on the island in the kitchen...The house is a quaint place, newer with all the updates...wifi wasnt very good but overall great place in a great area! We did catch a nice size bass and a wall eye right off the dock! Thank you for sharing your place with us! Had a wonderful weekend! Was there with my 3 sisters and we were celebrating 3 birthdays. I turn 50, one turned 60 and another will turn 70 in January. House was perfect, the lake was clear and quite. Had a great fire the last night to kick off fall. Will be back! Beautiful lake cottage with all the amenities! This is a truly special place tucked away in a very peaceful area of Michigan. We were grateful to find all the thoughtful amenities provided, from games for kids, beach towels, a variety of culinary utensils..(I think we made use of all of them!) to the many creature comforts that are often missed when traveling! Thank you so much, Kim for sharing your home with our family for this short but very sweet stay. We highly recommend this home for anyone looking for a wonderful lakefront getaway, with all the comforts of home! We loved the 3 bedroom / 2 bath house! Since it was recently renovated, everything worked well and was clean. The kitchen was big enough to fix every meal for the 2 small familes. It had a great big yard for campfires as well as our badmitten court. The house had a dock so we rented a boat for lake cruising and fishing. The owners were quick to answer any questions prior to, during and after the rental. Overall an excellent week.